For the Outdoors Issue we thought about blagging one of Carluccio’s new hampers that they announced this month. But they cost £45 and we thought you could probably get a mountain of food from ASDA for that. While investigating where you can eat surrounded by grass and trees we discovered that every park these days has a café – St Ann’s Well Gardens, being the most middle class park in Brighton, was thought to be the nicest. Between torrential showers the sun came out and we brushed the rainwater from a table overlooking the immaculate bowling green. There’s a pretty solid menu but The Garden Café is all about the ever-changing seasonal speciality board, which is considerable and tempting. The mackerel paté (£4.99) comes with plenty of crunchy toast, rich onion relish, a decent salad and is smooth and full of flavour. In fact there’s plenty of leafy goodness on each of the plates; the side salad (£3.50) being conventional, but all the ingredients – tomatoes, cucumber, red onion, a variety of leaves – were tasty and fresh. The chicken, chorizo and mozzarella burger is far from the average KFC-esque offering. The chicken breast seems grilled and it isn’t drowned in mayonnaise – in fact it almost feels healthy. Two large slabs of chorizo can’t ruin that impression and the mountain of chips (not home cut but cooked well) is balanced by a huge, fresh, olive-topped salad. There’s not much reviewing you can do about a baked potato with cheese (£4.50 with beans included), but in the criteria of being crispy outside and soft inside it performed well. A lovely experience, it might not be the cheapest café to grab a snack for your hungry niece but it’s a nice change to going to a restaurant for lunch. 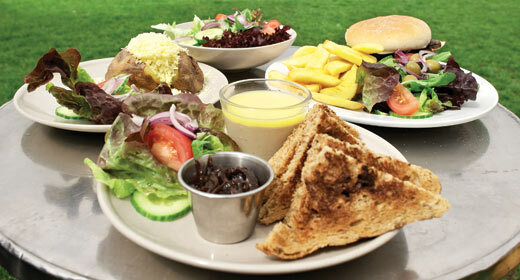 The food was really good quality and The Garden Café really put the fresh into alfresco. No way, we sat miles away from the café in the middle of the slightly damp park. Unless the dog walkers were spies, we got away with it.